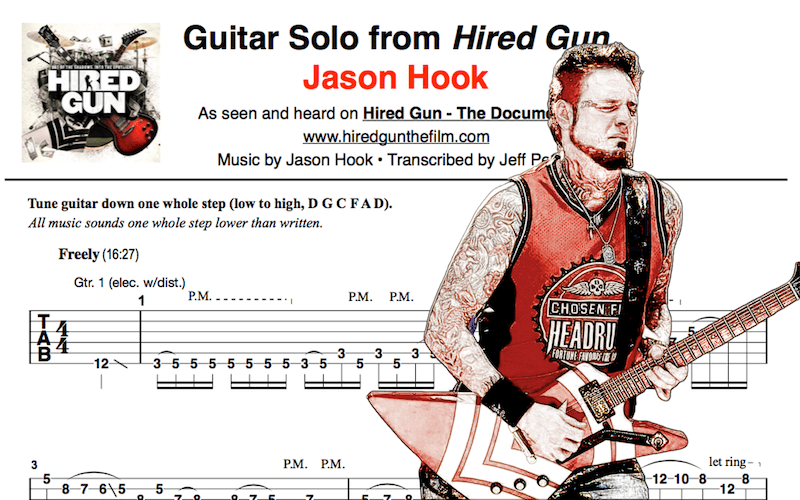 Guitar tab and lesson shows you how to play Jason Hook’s blistering guitar solo, showcased during his on-screen interview for the rock music documentary Hired Gun. Released in 2017, Hired Gun is a rock music documentary focusing on session and touring musicians from famous bands and artists such as Metallica, KISS, Nine Inch Nails and others. While the majority of the film concentrates on capturing the stories and accountings from a handful of venerable session players in the industry, one of the memorable highlights which stood out to me as a guitar player was Five Finger Death Punch guitarist Jason Hook performing a blistering rock guitar solo in the midst of his own personal recording studio. On the anniversary of the Hired Gun theatrical release, I reached out to Hook (who is also the executive producer for the film) to give some insight into his performance and to share a few tips for guitarists looking to learn how to play some of his blistering solo licks and melodies. Check out Hook’s solo below, then download the PDF here. As Hook ascends the A minor pentatonic scale throughout the first two bars, he frequently applies palm muting to certain notes in order to create powerful, punchy-sounding rhythms. In the transcription, the abbreviation “P.M.” illustrates exactly which notes should receive a palm-mute technique. Bars 2-4 largely revolve around a fifth-position, A minor penatonic blues scale. To replicate Hook’s flowing lead lines, pay attention to any arced lines, called slurs, appearing above notes. Slurs indicate wherever Hook performs any hammer-ons or pull-offs. If you have any trouble figuring out how to finger a particular note passage, try locating the corresponding part in the YouTube clip and viewing at a slower playback speed. Throughout the transcription, diagonal lines indicate where Hook uses a slide technique to move into or between notes. For example, Hook uses ring finger notes slides to create the cool-sounding ascending 5th-interval lick in bars 7 ad 8. To create the screaming note bend on beat two of bar 11, Hook intentionally catches the second string under his ring finger while performing the bend technique. The dissonance created by playing two notes with different bend intervals, combined with heavy distortion results in a cacophony of harmonic overtones which really makes his note jump out from the speaker! Download the PDF to view or print the full transcription. Visit www.hiredgunthefilm.com to learn where you can watch the documentary in it’s entirety. Sponsored by Guitar Tab Tutor app for iOS. Master all essential guitar techniques with the ULTIMATE reference guide to guitar TAB! Download today for FREE!